Melt The Switchboards Monday! | We Have Brass In The Plaque! 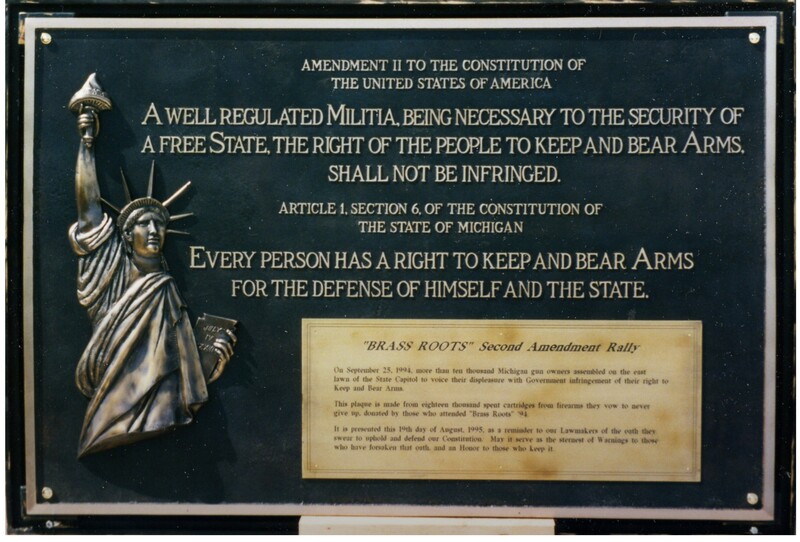 Spent shell casings were collected, melted down and made into a plaque commemorating the rally and casting in brass the Second Amendment to the US Constitution and Article I, Section 6 of the Michigan Constitution — alongside a 3-dimensional Statue of Liberty relief, created by famed, Michigan sculptor, Edward Chesney. to add it to the agenda to be voted on. Please call, email, and fax Wayne Schmidt to urge him to place HB 5595 on the December second agenda, and get everyone you know to do the same! Schmidt was just elected to the State Senate to represent the 37th district, so calls from constituents in either the 104th State House district, or the 37th State Senate district will be especially effective. All legislators are primarily accountable to people who live in their districts, so if you know sympathetic constituents in any committee member districts, please urge them to join our effort. Naturally, anyone who can show up in person Monday or Tuesday should do it. There are only three weeks left in the 2014 legislative session. If we don’t get this passed in the next three weeks, then the entire process must be restarted in 2015 assuming the bill is even reintroduced. There will be a legislative action day on December 10th, and it would be nice to have this bill in play by then. Finally, while you are speaking to committee members, you may also ask them to support HB 5867. This is an unrelated bill, other than the fact that it’s author is Martin Howrylak who also authored HB 5595. While it is not normally good practice to support a bill because you like a different bill by the same legislator, HB 5867 is a common sense bill that would recognize people who must use motorized or manual wheelchairs as pedestrians rather than motorists. PLEASE CHECK BACK FOR UPDATES, AND MARK YOUR CALENDARS FOR DECEMBER 10TH!